Headquartered at the University of Maryland, START maintains the Global Terrorism Database, the most comprehensive source of unclassified information about terrorist attacks, with statistics dating to 1970. START, one of 12 Centers for Excellence funded by the Department of Homeland Security, plans to release its full database in December but shared its early findings after a request by CNN. This year is expected to outpace even 2012’s record high. There were 5,100 attacks in the first six months of 2013, said Gary LaFree, START’s director, and the wave of violence shows few signs of ebbing. In recent weeks, Al-Shabaab, a militant group based in Somalia, attacked a mall in Nairobi, Kenya, leaving 67 dead; suicide bombers killed 81 at a church in Pakistan; and the Taliban took credit for killing two police officers with a car bomb in Afghanistan. To find and tally attacks like those, START's computers comb through 1.2 million articles from 50,000 media outlets each month with an algorithm to help identify and eliminate redundancies. Its 25-member staff then studies, categorizes and counts each attack. • It was aimed at attaining a political, economic, religious or social goal. • It was intended to coerce, intimidate or convey a message to a larger group. • It violated international humanitarian law by targeting non-combatants. Part of the observed increase in 2012 may be due to the fact that START has improved its data collection methods and is better than ever at finding and categorizing terrorism, LaFree said. But he said the dramatic rise is not just a matter of having better data. Outside of small dips in 2004 and 2009, the number of attacks has steadily increased in the past decade, according to START. The upward trend increases the likelihood that 2012’s numbers are not an aberration, LaFree said. Counterterrorism experts not affiliated with START also said attacks appear to be occurring with increasing frequency. • Weak and unstable states and corrupt or ineffective governments. • Poverty and high unemployment, particularly among young men. • Access to more lethal weaponry and increasing use of tactics like suicide bombings capable of killing scores of bystanders. • A spike in sectarian tensions between Sunni and Shiite Muslims, where ancient grudges give rise to modern massacres. • The increasing use of terrorism as a tactic in war. “The distinction between the front line and home front has largely been erased as terrorism has become a growing feature of contemporary warfare,” said Brian Michael Jenkins, a senior adviser at the RAND Corp. and the founder of its counterterrorism program. But Jenkins also cautioned that “terrorism” is notoriously difficult to define, and the increase in attacks does not necessarily mean the United States is “losing the war on terror.” He said it could just reflect a shift in strategy among Syrian rebels and Afghani radicals, for example. Still, experts say the apparent increase in civilian casualties is alarming. Bombings and explosions were used in 58% of terrorist attacks in 2012, but it wasn’t always this way. In fact, START’s data also show a dramatic global shift in terrorist tactics and hot spots. 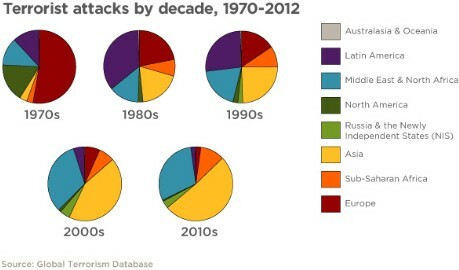 In the 1970s, most attacks were committed with guns and occurred in Western Europe. In the 1980s, Latin America saw the most terrorist acts. Beginning with the 1990s, South Asia, North Africa and the Middle East has seen steadily rising number of attacks, a trend that has accelerated in recent years. Although terrorism touched 85 countries last year, just three - Pakistan, Iraq and Afghanistan - suffered more than half of 2012’s attacks (55%) and fatalities (62%). In January, Sunni suicide bombers attacked scores of Shiite pilgrims in Iraq, killing at least 73. In February, a car bomb outside a café in Mogadishu, Somalia, left 15 dead. In March, a bombing in Thailand killed 14 and injured 340 in a commercial district. Just eight private U.S. citizens died in attacks outside the United States in 2012, all in Afghanistan, according to the State Department. In the United States, seven people died in 11 terrorist attacks last year, six of them in a shooting at a Sikh temple in Oak Creek, Wisconsin. Despite the death of Osama bin Laden and capture of other key al Qaeda leaders, the group has exported its brand of terrorism to other militant Muslims, according to START and other counterterrorism experts. Afghanistan’s Taliban was by far the deadliest group in 2012, when it launched 525 attacks that killed 1,842 people. The second deadliest group was Nigeria’s Boko Haram, a jihadist group that orchestrated 364 attacks last year that killed 1,132 people. The next most deadly were al Qaeda in Iraq, the Communist Party of India-Maoist, Somalia’s Al-Shabaab, al Qaeda in the Arabian Peninsula and Pakistan’s branch of the Taliban. In April, START compiled a separate report for the State Department that counts fewer attacks (6,771) and fatalities (11,098) in 2012 than its own report because the U.S. government uses slightly different criteria to define terrorism. 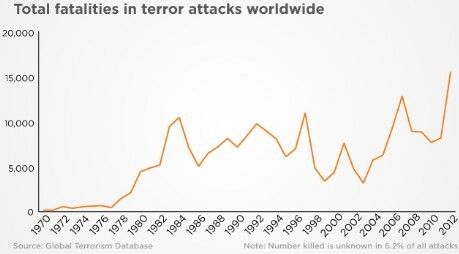 Those lower numbers still represent an all-time yearly high in the number of attacks, according to START’s database. Despite top terrorist groups’ affiliation - sometimes tenuous - with al Qaeda, some do not fit the mold created by its former head, bin Laden, and current leader, Ayman al-Zawahri, said Benjamin, the former State Department counterterrorism coordinator. Bin Laden was motivated by an apocalyptic vision, Benjamin said, and wanted to spark a global war between Christians and Muslims. The power struggles in many Muslim countries, on the other hand, are driven as much by political as religious concerns, according to Benjamin and other terrorism experts. And while most terrorism in 2012 was committed in Muslim-majority countries, LaFree and other experts cautioned against viewing Islam itself as inherently violent. Like Benjamin, Rizwan Jaka, a Muslim leader based in Northern Virginia, said that political - not religious - motivations lay behind many acts of terrorism. Still, American Muslims are working to reduce Sunni-Shiite tensions, said Jaka, a board member of the Islamic Society of North America. The Fiqh Council of North America, an influential group that issues rulings based on Sharia, or Islamic law, released a fatwa endorsed by dozens of Muslims in 2005 categorically condemning terrorism. More recently, the Islamic Society of North America has met with African and Middle Eastern leaders to urge them to protect the rights of religious minorities and discourage terrorism. In September, Sunni and Shiite leaders meeting in Washington announced an agreement to set aside differences and address the “dire situation of unrest, destruction, genocide and refugees” in many predominantly Muslim countries. Terrorism is a serious threat for global growth & it is needed to be vanished.